Tiger Boy by Mitali Perkins. Grades 4-6. Charlesbridge, April 2015. 144 pages. Review copy provided by my local library. Neel loves his home in an island village in India. He loves his mother’s cooking. He loves swimming in the nearby ponds. And he loves the tigers that live on the preserve on a neighboring island, the only place where wild Bengal tigers still live. 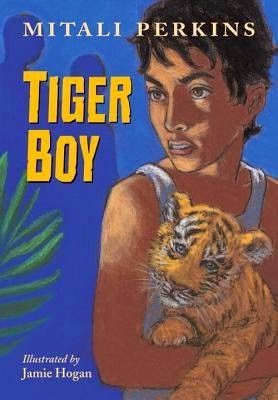 When Neel and his friends learn that a tiger cub has escaped from the preserve and is thought to be on Neel’s island, they know that they have to look for her. It’s not often that tiger cubs are born in the preserve - every one is precious. Neel’s teachers have nominated him for an important scholarship, a prize that could be his family’s ticket out of poverty, and Neel knows that he ought to be studying instead of patrolling the island for a lost tiger cub. But when Neel finds out that Gupta, a corrupt businessman, is also searching for the cub, Neel knows that he has to be the one to find her. If Gupta finds her, he will most likely sell her on the black market for her beautiful fur and Neel can’t - he WON’T - let that happen. Can Neel find the lost tiger cub in time? If he joins the search for her, is he giving up his chance for a good future? Okay, friends, I judged this one by its cover initially (the cover, to me, is not super appealing). But it kept getting great reviews from my friends on GoodReads and when I finally picked it up, I was so glad I did! Lesson: do not doubt Mitali Perkins. This is an engaging story that will be a super hit with kids who love animals and/or adventure stories. Cultural details bring the Indian setting to life, detailed while still being accessible to kids who have no knowledge about India. The pacing is on-point; this is a short book that will hold the attention of its audience. There's plenty of tension as the reader wonders if Neel will find the tiger cub in time (and also, y'know, what Neel will do about his entire future, which rides on this scholarship). Neel's reluctance to leave his family home (and thus his reluctance to study for the scholarship exam) is believable. It shows that smart kids can be reluctant learners, too. Neel needs to find inspiration to continue his studies, he needs to be shown how attending a good school can enable him to do something he cares about. I found that transition to be believable, too. And, after all, who doesn't love a story in which a kid protects a baby tiger?! Answer: no one. Everyone loves that. I would suggest this to kids in 4th-6th grade. I'm excited to have a shorter book I can bring to our middle schools for booktalks (I feel like every book I bring there is so LONG!). Rickshaw Girl by Mitali Perkins - this book brings its Bangladeshi setting to life in much the same way as the Indian setting in Tiger Boy. Chasing Cheetahs by Sy Montgomery (and other books about animals) - Tiger Boy is a great pick for kids who love wild animals and want to learn more about them. Can We Save the Tiger? by Martin Jenkins - this book about endangered animals includes a passage that I kept thinking about while I read Tiger Boy, about why folks in India might hunt tigers even though they know they are endangered. This would be a good readalike for kids who enjoy exploring environmental themes. The Misadventures of the Family Fletcher by Dana Levy - okay, this is a little bit of a wild card, but i think that kids who enjoy reading about Neel's family in Tiger Boy and/or kids who identify with Neel's struggle to figure out his future might also find some of those elements in The Misadventures of the Family Fletcher.